In one of my previous posts (ATTiny85), I detailed an ATTiny85, or in my case the ATTiny85 SMD chip. These chips are al the same only the package is different. 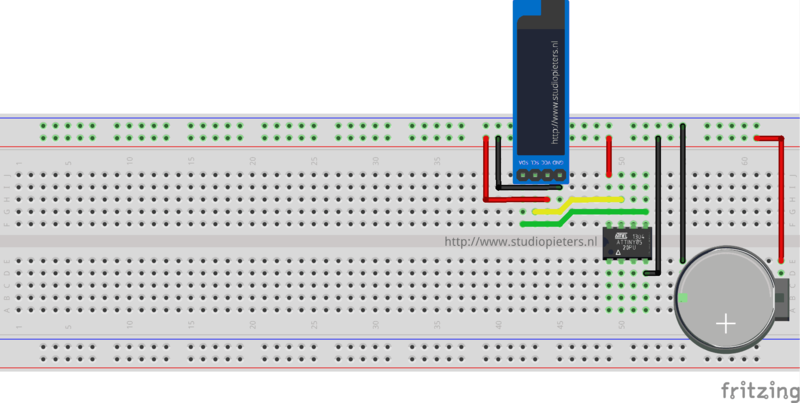 In this blog I will use a ATTiny that is breadboard friendly in combination with a I2C OLED. 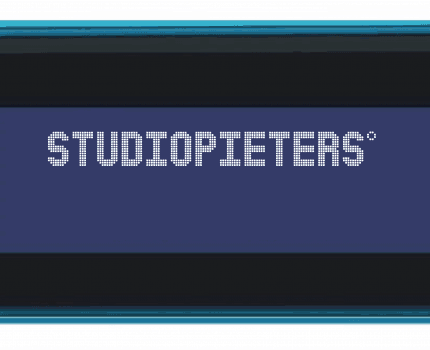 OLED 0.91 inch is a monochrome graphic display module with a built-in 0.91 inch, 128X32 high-resolution display. The OLED 0.91 inch is able to work despite the absence of back-light. In a dark environment, the contrast of OLED display is higher than LCD display. This device is I2C or SPI compatible. Due to its capability in displaying, it is often used in various application for instances, smart watch, MP3, function cellphone, portable health device and many others. OLED display, no need back light, self-illumination, The display performance is better than the traditional LCD display, also lower power consumption. It’s Driver IC is a SSD1306 and the Size is a 0.91 inch OLED with a resolution of 128 x 32 pixels. It has a IIC interface and the display Color can be white or blue. I want to find out how to connect a ATTiny85 to I2C OLED Display. If you don’t know what a ATTiny is you can read about it here. I will use a Arduino Board as ISP (You may use the Arduino board of your choice, but you need to take note of the pins used for your board when using it as an ISP.) Then we need A ATTiny85 integrated chip. An I2C OLED display in my case, I am using the Oled display 0.91Inch I2C 3,3V-5V. some Jumper wires and a Breadboard. Here you will find the ATtiny85 pin-out, and read further how to connect this to the Arduino board to upload sketches from it to the ATtiny85 integrated chip. Connect the following (I am using an Arduino Nano, so you have to take note the necessary pins of the board you are using when using it as an ISP). ARDUINO AS a programmer / ISP. In my previous blog here. You can find how to setup a Arduino as a Programmer / ISP. Once you have followed these steps you can add the required library. Now we need to install the required library. But first I need a library that is small enough for my ATTiny85. Using Google I found Tiny4kOLED library here. To get this Library working you need a prerequisite library called TinyWireM.h. You can find this one here. Install these two library’s into your Arduino IDE software. Since our OLED display is using I2C, we only need 4 pins. VCC, GND, SCL and SDA. From the ATtiny85 pin-out, you will see VCC (chip pin 8), GND (chip pin 4), SCL (chip pin 7, PB2) and SDA (chip pin 5, PB0). Connect the corresponding pins for these two modules. Make sure that the connections are as stated as described here above. Open the program / sketch you want uploaded to your ATtiny85. Go to Tool and setup the following. Upload your desired sketch to your ATtiny85 (or your preferred board) by going to Sketch > Upload Using Programmer. The sketch should be uploading to your ATtiny85 at this stage. // Wrap strings in F() to save RAM! I removed the wires connecting the Arduino Nano and the ATTiny85 and powered the module with a CR3230 Battery. Power the I2C OLED from ATtiny85’s 5V pin and GND pin.